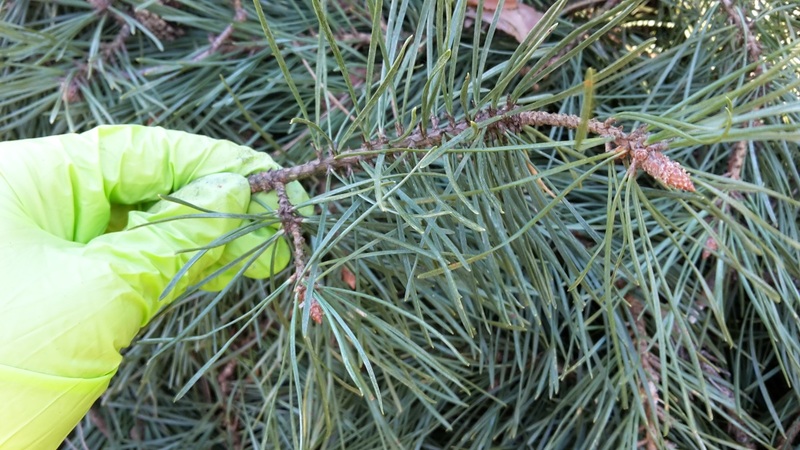 We have some large pinetrees in our yard and for few years i have imagined to get their buds or yet green cones to make a healthy syrup myself. There were one or two windy snow storms this winter and few large branches broke and stayed hanging wrapped together with other branches. As you can guess that does not felt safe so we hired professionals to get them down and that is how i finally got to harvest pine buds this year. Usually pine buds for syrup can be harvested till April/biginning of May, but this year has been quite cold, so you can manage for another week or two. After buds will start opening and won’t be good for syrup, but that will be the time to harvest pollens. Later, in June, green cones can be harvested for syrup. When harvested from sawn branches, there are no rules. But if you have an option to got to coppice, then do not harvest buds from branch endings. From theory best buds come from coppices and it might be easier to harvest there. I suggest to harvest with gloves if you don’t want to have resins all over your hands. As i am completely new in this pine syrup thing, i used google to find 4 or 5 different recipes and decided to try out 2 of them – first the “fast way” with boiling buds, so we could try syrup the same day and second without boiling buds, but syrup won’t be ready for 10 more days after preparing. Boil 1 part buds and 2 parts water in enamelled pot for 15 to 20 minutes (don’t use your best pot, because part of resins will remain on its sides). At the end add boiling water to the starting level. Let it to cool down and pour through a strainer. Add sugar 2 parts to 1 bud liquor. Bring it to boil on low temperature. Pour in glass bottles and store in fridge. Use for cough 1 tablespoon (adults) or 1 teaspoon (children) 3 times a day, when drinking warm tea or milk. They say leftover buds can be desiccated in oven 50C temperature and used as tea. My assessment: Syrups taste is quite good, but it isn’t as sweet as pine cone syrup we bought in Poland Tatri, this is quite bitter. But Toms agreed to drink it, not as happy as for little daisies cought syrup though. It is good as a fast version, especially if You or kido already have colds, because it can be used the same day. But the bud tea is something awful – so, so bitter! I added plenty of honey and was able to drink about 200ml, but i hope the buds after second recipe will be better. * Recipe taken from here. Boil syrup from 0,5kg sugar, 0,5kg water and 1/2 lemon juice (i used half of given amount). 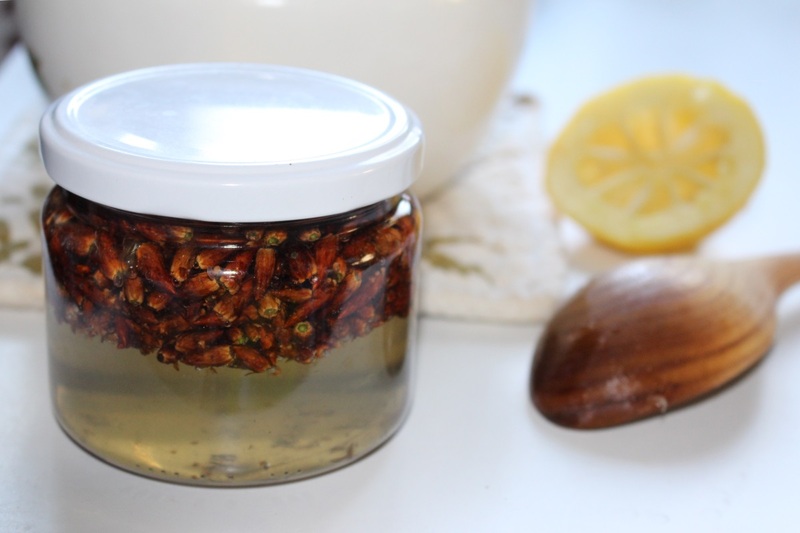 Put pine buds in a jar to its middle and pou the hot syrup over to the top. Close and put on a sunny window sill to prepare for 10 more days (don’t open during). Pour in glass bottles through strainer and keep in fridge. Use for cough 1 tablespoon (adults) or 1 teaspoon (children) 3 times a day. Desiccate buds in oven 50C and use as tea (have heard they can be eaten candied – will try when ready and let you know!). My assessment: Syrup is tasty and I can feel lemon sourness. And buds are way better, completely different! Lemon has taken away their bitterness, but I don’t think we will eat them as candied fruits because of the feeling like I would be chewing a piece of wood. For tea – yes!, thay are good and healthy. If I have to compare both recipes, I would prefere this one, because of not boiling the buds (maybe I am wrong, but I think that boiling can take away some of their healthy properties), but this fact also is the one You need to be careful about. 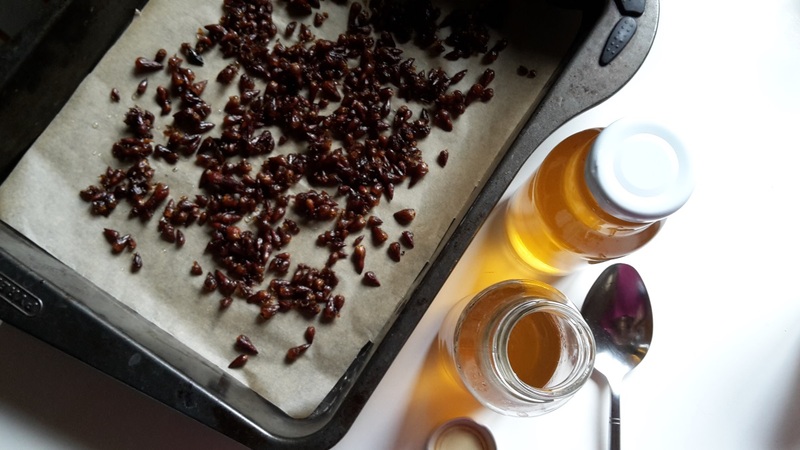 Jar has to be sterilised, lid has to be perfectly clean and closed properly, buds have to be checked to avoid any smallest bug staying in them, otherwisw syrup can turn sour.